Continuing Education Credits (CECs) are accumulated by attendance at recognized educational forums. Regularly scheduled (weekly, monthly) conferences such as, but not limited to, journal clubs, case conferences, or multidisciplinary team meetings are not eligible for the accumulation of CECs. These are considered part of the job responsibilities of genetic counsellors and are therefore considered to be included in CPCs. Continuing education programs that do not relate directly to genetic counselling are not eligible for continuing education credits. CECs are accrued at the rate of 1 credit per hour of educational session attended. No credits are granted for attendance of business meetings, committee meetings, poster sessions or social events at these meetings. Credits are granted only for educational or workshop sessions. Online educational courses will be considered for CECs provided that proof of attendance can be shown. For conference organizers who are requesting CECs, we recommend that the Application for Approval of CECs be submitted to the Certification board at least 3 months prior* to the start of the conference. This will allow for the acceptance letter to be sent prior to the start of the conference as well as for the conference organiser to include the number of CECs in the conference program and/or the attendance certificate. The number of assigned CECs will also be noted on the Current CEC Assignment for Education Meetings. The conference is then considered a "Recognized Educational Session" for that time only. If the conference is held again the following year, the conference organizers would once again need to apply for CECs. 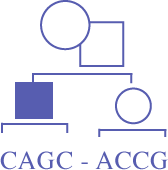 The following annual meetings are automatically reviewed by the Certification Board and conference organizers do not need to apply for CECs: CAGC, NSGC, ASHG and ACMG. The number of CECs awarded will be posted as above. For applications received less than 3 months prior to the start of the conference, we cannot guarantee the receipt of the acceptance letter prior to the start of the conference. Applications for unrecognized educational sessions need to be submitted to the Certification Board within 12 months following the end of the conference or online course. Applications submitted after this time frame will not be processed. We aim to send an acceptance letter to the individual within 3 months of the receipt of their application, listing the number of CECs assigned. That meeting or online course will then be approved for that individual only, and not for all conference attendees. Each individual is then required to maintain the original letter along with proof of attendance. Please note: not all educational sessions that are approved for CEUs by the ABGC will necessarily be approved for CECs by the CAGC Certification Board as well. Please note that Applications for CECs are now online. a hard copy of the application form to submit by mail. Please NOTE: educational sessions approved for CEUs by the ABGC will not necessarily be approved for CECs by the CAGC Certification Board.